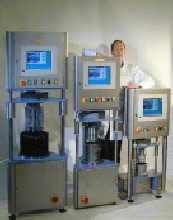 The first portable version of a ConTec rheometer was done in 1996 and was tried out in ready mixed station. It was though not made as a product as it too limited regarding workability area of fresh concrete and was still relatively big. 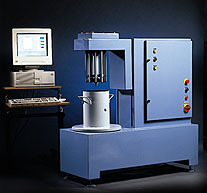 An offspring of the Rheomixer was the Rheometer-4SCC which is a field instrument to evaluate self compacting concrete (SCC). This instrument can also be on conventional vibrated concrete, but then with modified Tattersall impeller. This instrument was introduce at the iBausil conference in Germany 2006. It is quite easy to use, requires about 7 liters of concrete for testing and the time from filling the material container, through testing and data processing, to emptying the container, is about 1½ minutes (even shorter than needed for the simple slump test). The next device was instrument that combined the mixing and rheological measurement on paste and mortar and was named Rheomixer. It was further developed to be also a semi-adiabatic calorimeter. Many thank to dr. Paul Sandberg. It took several years to develope the device so it could be commercial product and it was not officially released until 2006.